Hey there. One the best things that you can do is sit and watch a movie with your family. I've done it many times. Where it be a feel good, heart warming movie or a history based flick. It's a great way to start up a conversation with your kids and take in their thoughts on the situations in the film. Don't pass up the next opportunity to talk to your kids. P&G Family movie night is this Saturday, June 11th on NBC at 8pmET/7pmCT! The film is Field of Vision and I've been fortunate enough to get a sneak peak! Trust me, it's one that you definitely want to watch and discuss with your kids, especially since it confronts the problem of bullying. There's been enough press on bullying that this movie is premiering at the right time to make an impact on our youth. I really don't want to give away the movie, since I want you to watch it, but I will say that the usage of the video camera was the star of the film. Through "mysterious" footage that was captured by a malfunctioning camera, Sinclair High School's star football player, Tyler, learns that his fellow teammates have been bullying the new transfer student, Cory. Tyler is torn between doing the right thing and staying quiet. He needs his teammates to win on the field and going to the coach with the bullying may be detrimental to his team. Will his passion for winning trumpt his moral integrity? But that's not the only images that the malfunctioning camera captures. Cory has a secret past that no one knows about, except Tyler's young sister Lucy. She stumbles across the footage and tries to convince her family that what she has seen is not in her imagination. As the story progresses, Lucy befriends Cory but will Cory ever find out about his secret past and have his questions answered? Check out the trailer below! It's a great movie and a can't miss opportunity to discuss bullying and doing the right thing with the kids. Faith Ford stars as Tyler's mom and she's always been a favorite of my wife's when she was on Hope & Faith. She really shows her acting chops in this film. 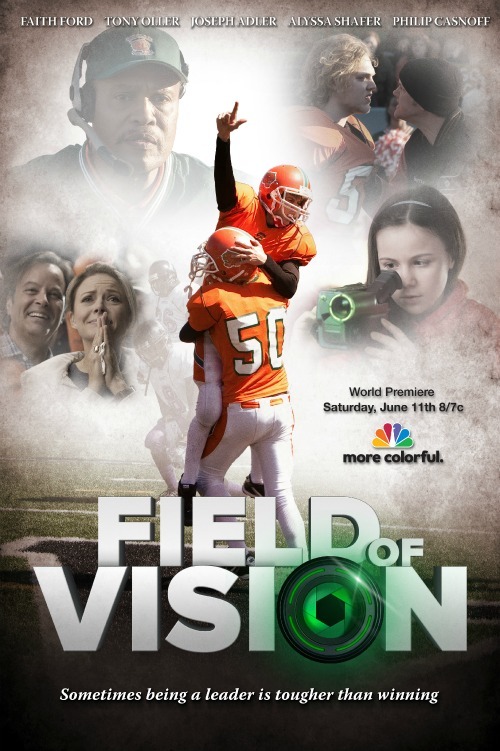 Make sure that you check it out on NBC this Saturday, June 11th at 8pm ET/7pm CT. You can read up on the movie at the Field of Vision website and make sure to stop by the Family Movie Night Facebook page for all future movie nights and times. Later!